Have you ever driven down the street and seen your neighbor’s sprinklers on while it is raining out? I know I have. What a needless waste of water – if someone was only paying attention it’d be easy to close the valve, save on water and save some cash when the water bill shows up at the end of the month. If only there was some type of technology that could determine the weather and water the lawn appropriately. Believe it or not, the same thing can happen at Kendall-Jackson. Of course, for us it is a vineyard we’re watering rather than the front lawn. Despite the best efforts of our vineyard crews, it’s not always possible for us to be on every acre of our vineyards at the same time checking the conditions. That’s why we’re excited to be part of a pilot program that could reduce our vineyard water consumption up to 20 percent. Water is precious; only about 1 percent of fresh water is available to humans and safe to drink. At Kendall-Jackson we work hard to conserve and make great wine, but the fact is we still use a lot of water. That got us to thinking: how can we better manage our water usage in the vineyards? 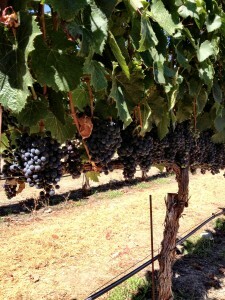 As you may know, growing great vineyards requires water, and lots of it. In order to reduce our usage, we currently use a drip irrigation system. Drip irrigation is a targeted application of water to a vine’s rootstock. In essence, we are able to water the vine efficiently with the added benefits of reducing soil erosion, nutrient loss, and weed growth. Despite this method’s effectiveness, our vineyard teams still have to manually turn the valves off and on. And this lack of automation reduces irrigation efficiency. Enter our new pilot program. We’re implementing a cutting edge “smart” irrigation system to reduce the amount of water we use. This is exciting because Kendall-Jackson is the first company in the US to use this technology in vineyards. So how does it work? The system uses sensors located in the vine canopy to measure temperature, wind and humidity. With this information readily available, the smart irrigation system can reduce water use in vineyards by applying the appropriate amount of water at the correct time. But it doesn’t stop there, additional sensors are placed at various depths in the ground to determine soil moisture, ensuring that we do not irrigate beyond the rooting zone – the most important part of the vine. A weather monitoring station is also used to forecast future meteorological conditions. For example, if we are expecting rain in a couple of days the system will alert our team and adjust water application accordingly, ensuring that the vine receives the appropriate amount of water, while conserving everywhere we can. As you can see, conserving water is the name of the game here at Kendall-Jackson, and this is just one of our many efforts to improve our sustainability performance, so stay tuned for the next update.